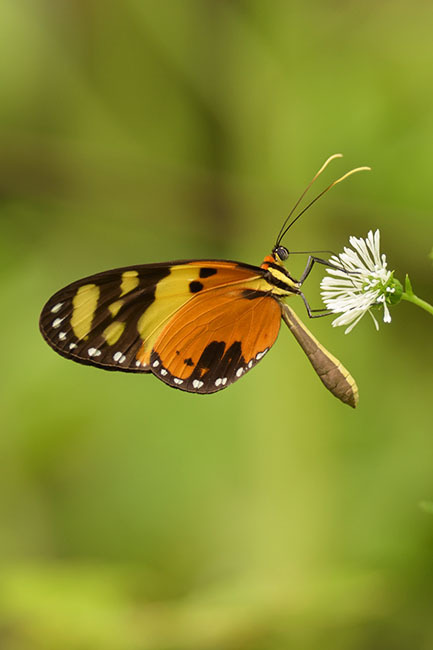 The Amazon river is over 4,000 miles long and despite deforestation the rainforest that surrounds much of it is still huge, so my brief visit could only give me a glimpse into the amazing variety of wildlife living there. I stayed at the Uacari Floating Lodge, located in the Mamirauá Sustainable Reserve and run mainly by local people to preserve the special habitat of the flooded forest. 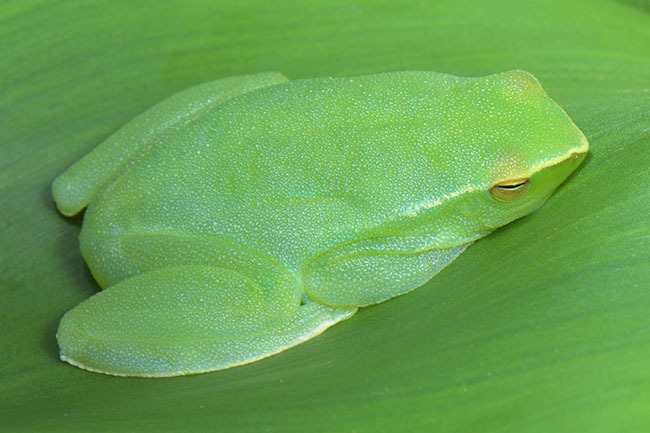 This is a section of rainforest that floods for up to eight months each year, meaning only creatures which are able to climb, swim or fly can live there. 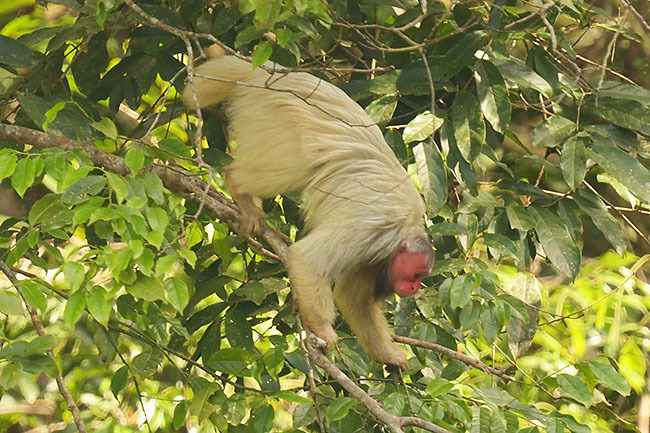 The most obvious mammals in Mamirauá are the five species of monkey which includes the rare Bald-headed Uacari... looking rather like an agile, shaggy moutain sheep leaping about in the tree tops but with the head of a bald, sunburnt man! 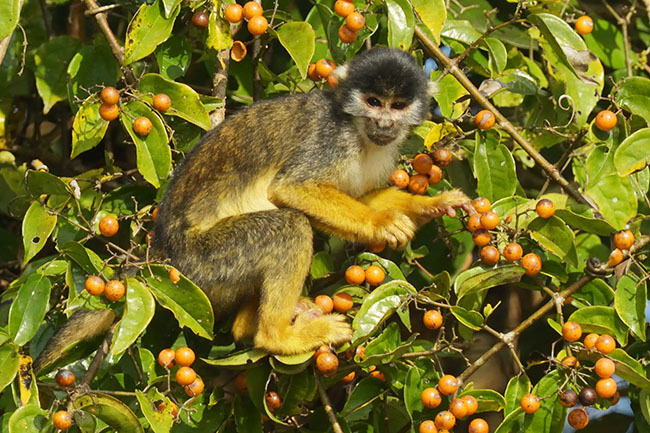 Black-headed Squirrel Monkey (Saimiri vanzolinii) feeding on fruit. 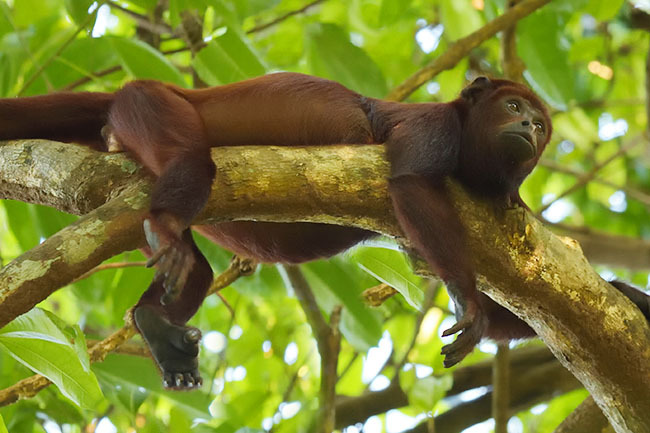 Red Howler Monkey (Alouatta macconnelli) relaxing in the treetop. 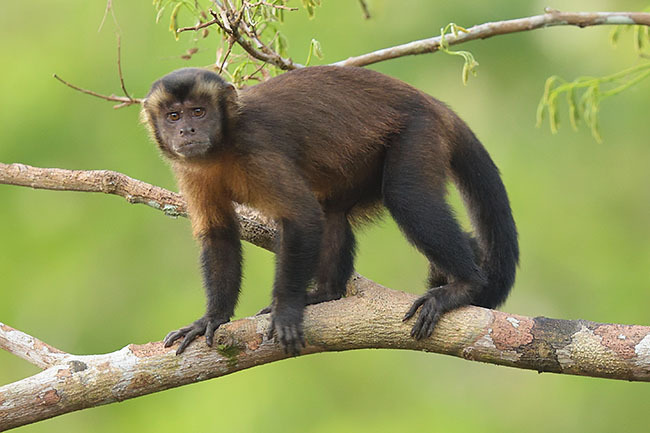 Tufted Capuchin Monkey (Sapajus apella)). 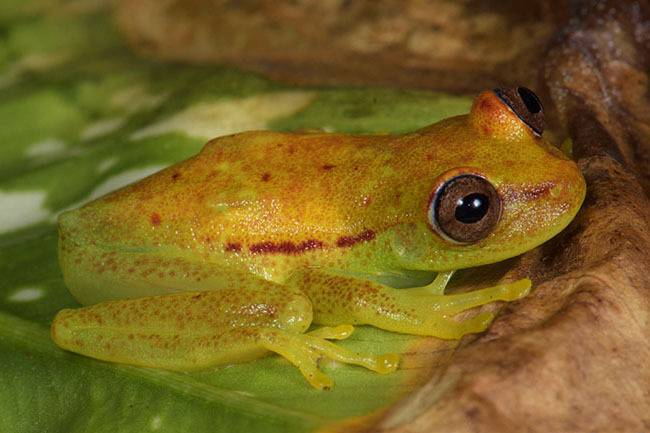 Of course the trees aren't the only place where mammals can live and the amazon is home to two species of dolphin. The Tucuxi is closely related to ocean dolphins and is thought to have moved into the river fairly recently. On the other hand, the Amazon River Dolphin or Boto has been in the Amazon for around 15 million years and is specialised for life in the muddy waters. It has almost completely lost it's eyesight and relies on echo location to find it's way around. (the markings on it's back are an ID code put there by researchers to help track the dolphins. 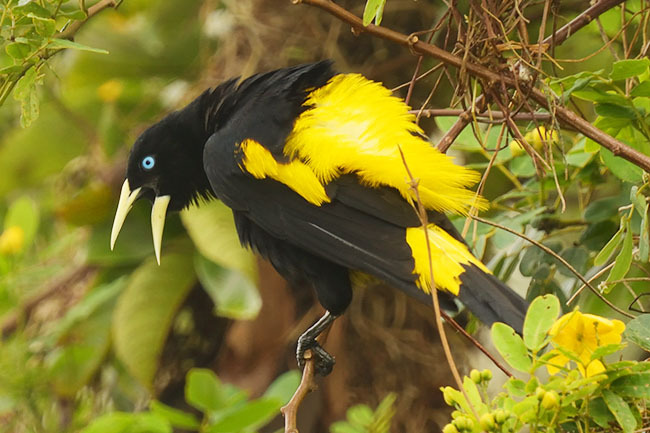 There are many species of bird living in the flooded forest, one of the noisiest is the Yellow-rumped Cacique which live in large, raucous colonies where they continually sqabble over nest sites. 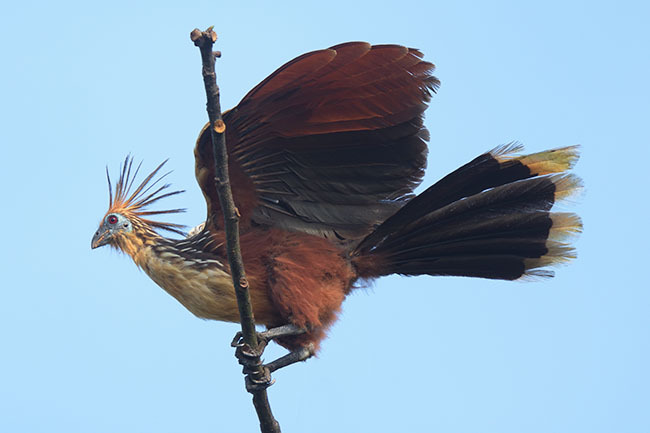 One of the strangest is the Hoatzin, sometimes called the Dinosaur Bird because it is thought to be very primitive and the young have claws on their wings like the dinosaur Archaeopteryx. Yellow-rumped Cacique (Cacicus cela) screeching at its neighbours. 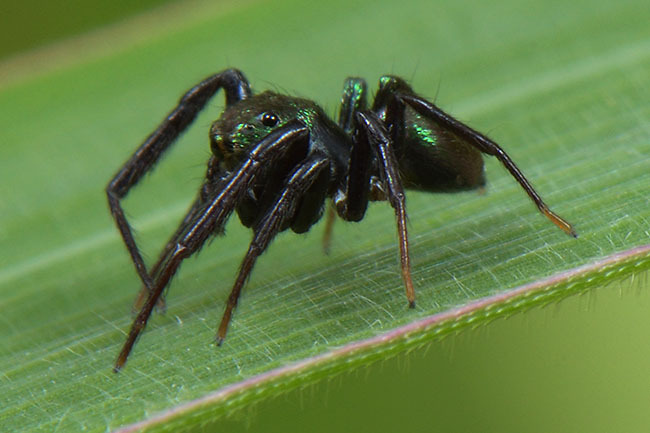 Like all rainforests, the amazon has a facinating variety of invertebrate life. 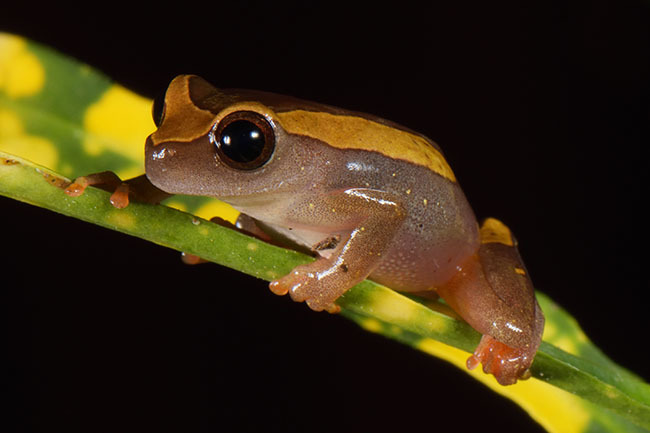 In the flooded forest they live on tree trunks, in the canopy and also on mats of floating plants and grasses. 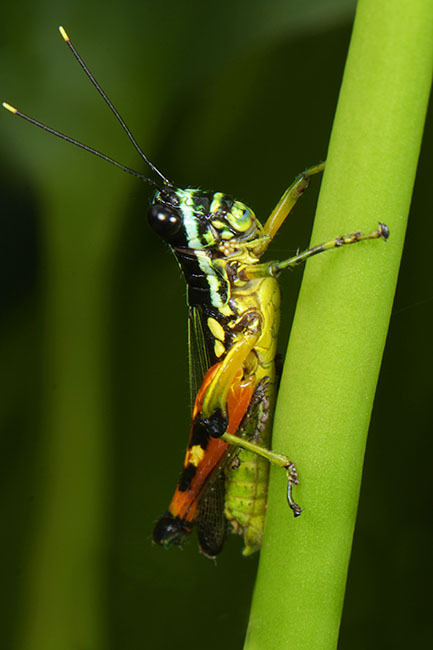 Surinam Rainbow Grasshopper (Tetataenia surinama) and Ludovic's Melinea butterfly (Melinaea ludovica).